I alternated these two 100 rep sets x 10 (5 each)= 1000 one hand swings. Each rotation took 6 minutes to complete x 5 = 30 min. total. I started with the intention of swinging the 12kg for the whole 30 minutes, making it a 1200 swing workout, but as usual, I never know how I'm going to feel until I start and I just wasn't feeling it out that way. I wanted to make it harder...enough...so I added in 100 rep sets w/16kg, those sets were tough! Realizing after set #9 that to make the workout 30 minutes long, it would be ending with a rest period of 30 sec., I chose to take 15 secs. of that last rest between sets #9 & #10...and then I just kept swinging the remaining 15 sec for an additional 10 reps, making it 1010 reps. in 30 min. I liked this high volume combination enought o try it another time, but for 60 minutes, or maybe I'll just keep this combination for those times when I just need a 30 minute workout...Adjusting the weight (maybe more sets with the 16, until I can do all sets w/16kg!) as I get stronger. Hey TR...I cannot wrap my head around 1000 in 30 Minutes. I might have to drop to the 12kg to get something like that done in 30 minutes. I think Im gonna take the reps back down, use the 32kg and work my way back up. Another idea I had for light days is to drop to the 15kg and do like you have done here and push the reps at a faster tempo. I think no matter what weight is used it is all good work. It's a few hours post workout right now and I'm feeling it! Partly because of the last 2 days, but this workout was awesome! Jam packed in 30 minutes! I don't like pushing for speed over endurance. Although, I could have swung faster adding in a few reps per set, all of these reps, including the 16kg, were chest high, cruising pace of 40 reps per min. Tons of fun (no pun intended, lol)! Let's keep it up , the possibilities are endless. 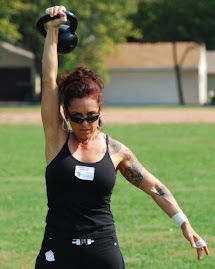 I am new to the kettlebell and have stumbled upon your blog. I have so much admiration and respect for you and your journey. You've come a long way. Question??? As a fellow trainer and fortysomething gal I wonder about overtraining by doing such a high rep of swings on consecutive days. As I said I am new to this amazing iron bell and I love it. But in following your journey I cant help but wonder where are your turkish get ups or figure eight holds? are you mixing it up elsewhere? please know this comes from a good place, just my 2cents. I think the 12kg is officially for warming up now. Tracy I am awestruck by your work ethics and your commitment to your lifestyle changes. But what the heck is next- standing on one leg and balancing plates on your head while swinging. Good God Girl- take a break and let some of us catch up. Thank you so much for your inspiration. Keep up the amazing work. I agree...if you can swing anything, nonstop, for more than 3-4 minutes, it's too light. I'll be working my way up to doing these 60 min., high volume workouts, with nothing less than the 16kg...eventually! Thanks for the compliments! What's next? Mmmm....well, I still haven't trained my pull ups or pistols....now that would be impressive...high volume pullups and pistols, lol. I can speak a bit to the overtraining issue. Overtraining( or more technically, overreaching) is when you are not recovering from your workouts. Training always depletes, and stimulates, an adaptive response. If the load is too great, or too frequent, you can't recover from it( and get the 'rebound" that propels one into new levels of functional ability).If one keeps pushing forward in a non recovered state then eventually overreaching becomes overtraining and can take quite awhile to recover from. Tracy has always had great cardio ability, a huge work capacity , very balanced structurally( which helps recovery immensely)and a focused serious mindset for her training. She has trained almost three years progressively and with no 'setbacks' or layoffs and has built up her workloads over that time. They are appropriate for her at her current level of ability. ONe must always train at the level of one's ability that allows them to stimulate new adaptations but also that one can absorb and that doesnt push one down too far. It's all very individual and always will be. But over time I realized, of course it would be stupid of me to try and copy them without the fundation Tracy has already built up, however, I still can take the _idea_ of a given workout and learn how to adjust it to my own level (shorter and/or less sets, lighter weight, more rest, etc.). So, what I mean is, even if you are new to kettlebell training, you can probably benefit as much from Tracy's ideas as I have and still do, you only have to know yourself enough to scale it down properly.